UTJ MK threatens to rebel if not granted chairmanship of Knesset committee; sources tell Arutz Sheva he never signed coalition deal. The new coalition is still taking shape, but it's already facing its second threatened rebellion over the allocation of portfolios, including the remaining ministries and powerful Knesset committees. Following Likud MK Ayoub Kara's threat to launch a one-man rebellion if he didn't receive a ministry, MK Yisrael Eichler (UTJ) has now leveled a threat of his own, penning a letter to Prime Minister Binyamin Netanyahu in which he vowed a rebellion of his own if not granted chairmanship of the Knesset Public Petitions Committee. In his letter, MK Eichler said that if he was not given the position he did not see himself as being bound by the coalition agreement between his UTJ party and Likud. Speaking to Kol Hai radio Monday morning, Eichler explained "I appealed to the prime minister to grant MK (Uri) Makhlev chairmanship of the Interior Committee and (to give) me chairmanship of the Public Petitions Committee. 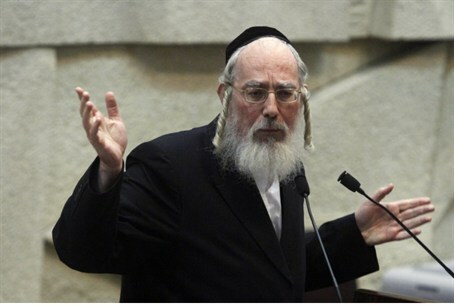 However, the haredi MK conceded he would "act according to the directives of his rabbi," referring to the Rebbe (Grand Rabbi) of the Belz hassidic sect of which he is a member, who had given his authorization to the coalition agreement even before its formal acceptance by the UTJ faction as a whole. Despite pleading poverty, Eichler's United Torah Judaism party has received a generous package as part of its coalition deal, including control over the powerful Knesset Finance Committee, and a full 87 concessions on issues including the Haredi Draft Bill and child benefits. That agreement has been the source of much fury within the opposition, particularly from the Yesh Atid and Yisrael Beytenu parties. According to well-informed sources, who spoke to Arutz Sheva on condition of anonymity, Eichler had already informed Likud MK and coalition negotiator Ze'ev Elkin that he did not feel he would be bound by any agreement signed by his party, pending his own list of demands. Elkin turned to UTJ's leadership, who attempted - unsuccessfully - to convince him to abide by the coalition deal.